Altman's movie is strangely nestled between two of the more popular hits in his filmography, 1970's similarly madcap M*A*S*H and 1971's sublime McCabe and Mrs. Miller. This story about a young man training to fly—with actual wings—features many of Altman's repertory cast: Bud Cort playing the eponymous flier; Sally Kellerman as his mentor/guardian; Michael Murphy doing his worst Steve McQueen impression; Shelley Duvall, making her own debut; and the rest of the cast includes both veteran Altman players (Rene Auberjonois, Corey Fisher, Bert Remsen, John Schuck, and G. Wood), as well as actors making their only appearance in his films (Stacy Keach, Jennifer Salt, and William Windom), as far as I know. Discussing this goofy gem too intensely is impossible without being incredibly reductive. So instead, here are some screen caps to display its glorious, off-kilter charm. 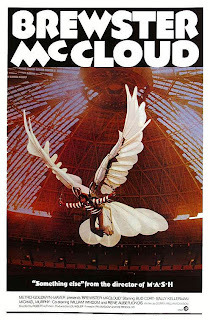 Brewster McCloud is available for pre-order now, exclusively at Warner Archive Online. This really is a wonderful mess of a movie. From the opening, with the MGM Lion overdubbed, the film's anarchic spirit is wonderfully established. It's not perfect by any means, but it speaks to me in a way that I find hard to describe, honestly. Great review. Alas, I no longer get to hold over people's heads that I've actually seen it. But it's about damn time this got a DVD release. Well put, Ryan. Anyone looking to quantify this movie in some way has their work cut out for him. There is an undeniable heart to the film, a joy in its contradictions, which dispels some of the accusations of cynicism often levelled against Altman.